To get images to the screen(s), the Parhelia card employs dual 400MHz DACs (Digital to Analog Converters) to drive CRT monitors, and dual DVI connectors for LCD screens. It also includes a TV-encoder (TV-out) which, of course, uses 10-bit colour like the rest of the GPU. The Parhelia can output to dual independent CRTs at up to 2048 x 1536 @ 32bpp, and dual LCDs at 1900 x 1200. The Parhelia can also accept an additional specialized DAC which will likely be integrated separately on the cards with the first run of the Parhelia. This will enable a triplehead (!) 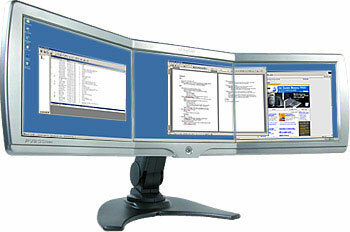 mode, with three CRTs or analog LCDs. In triplehead mode, the three displays will be slaved together to create a rectangular desktop at a resolution of up to 3840 x 1024 @ 32 bpp. Yikes! The triple head mode has a lot of potential for business use, but what about games? Covered. Triplehead mode provides full 3D support, and used in conjunction with games that support multiple fields of view as an option (Jedi Knight: Outcast, Quake III Arena and Microsoft Flight Sim 2002 being some of the current crop that do) you can get a panoramic view across all three monitors!